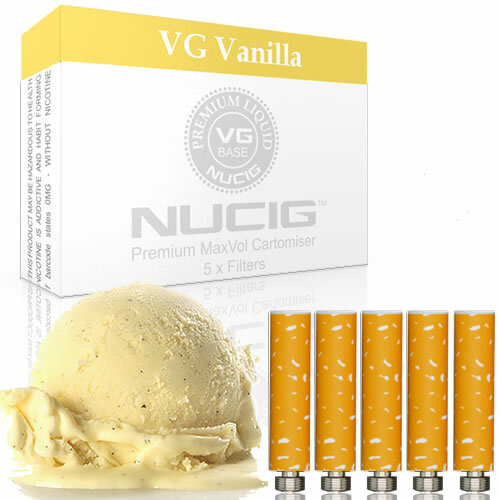 NUCIG® Vanilla Flavour MaxVol Filter Pack. A little disappointed with 2 of the pack's not lasting it's seems as if they have not filled the tips up with liquid put one tip in at 10:00 it ran out at 11:50 I'll see what the rest of my orders like. Nucig products are definitely worth getting. I've bought mine through a third party website and after I ran out of cartridges I thought I'd order a different pack and flavor from the official website and ordered on the 14th.. Confirmed order and it said I would have it between 2-5 working days and now its the 22nd so really can't review a product that I haven't even tried yet. I find it silly emailing customers to ask for reviews before asking whether they received their item. Overall nucig would have been a 5 star product but the delivery is crap. I could have had an email at least to say if there were any delays! But no. Sorry your order is not recd - it is being investigated very closely. Emails are automated and go out after 5 days - most customers normally receive their orders as early as the next day. Once we ship, we are no longer in direct control as it passes thorugh royal mail network. This week has seen severe UK weather, this can cause delays.